Chiropractic treatment for scoliosis any care can be a nightmare. Chiropractic treatment for scoliosis, any care actually, can be a nightmare. In this world of crooked and crumbling spines, of one thing you can be sure; you are not alone. In fact there are more crooked spines out there than straight ones. Hence this page on the Chiropractic treatment for scoliosis. The good news is that only some scolioses give pain. Chiropractic treatment for scoliosis is sometimes absurdly simple; could just a lift in your shoe make a huge difference? Scoliosis is often caused by a short leg. 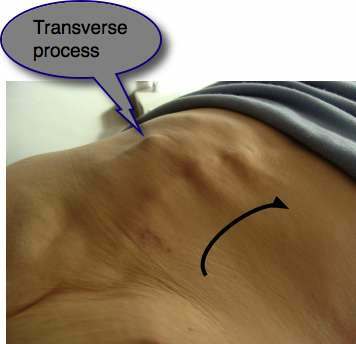 It's really quite rare for the vertebra to be so rotated that the tip of the transverse process (TP) protrudes through all the muscles layers, and is visible just under the skin. Each vertebra has three appendages for muscle attachment, giving the fine control of back movements. 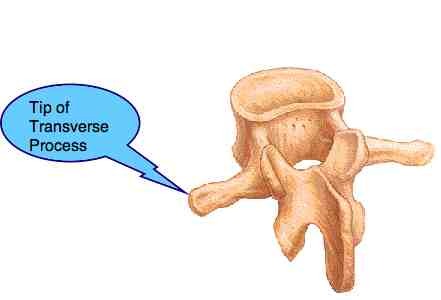 Two of them are called transverse processes, the third a spinous process.The SP below is unlabelled. 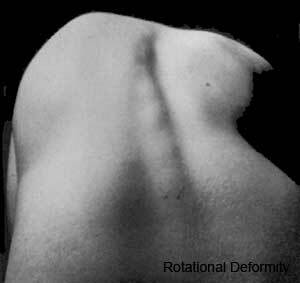 Miss M's scoliosis was "discovered" when she turned 19. Before that obviously nobody (with any clinical judgement) looked at her back. Mind you, I suspect her gardener, given the opportunity, could have seen that something was awry. Since then she has been kept functional by a variety of chiropractors, old generation chiropractors who actually adjusted her back. She swears by them, but they alas are no longer. A much respected orthopaedic surgeon made a crucial mistake. He prescribed a built up RIGHT shoe to be made by the hospital orthotist. But Miss M has a short LEFT leg. She reports that she could not wear it for more than two hours before she HAD to take it off. She's a gutsy woman and ignored threats that her body would take time to get used to the new built up shoe, and that she would soon be in a wheelchair if she didn't wear the prescribed shoe. Wise woman, she KNEW that that damned shoe was no good for her. Of course it wasn't! Sometimes that INNER WISDOM is far smarter than all the doctors, chiropractors too. ASIDE: Have you taken your child to the chiropractor for a screening? You should you know. "In health care, every doctor tends to rise to his level of incompetence." adapted from "The Peter Principle". There are many causes of scoliosis. Frequently the cause is "idiopathic" - meaning arising spontaneously or from an obscure or unknown cause. However, in Miss M's case this is clearly not so. She has no family history of scoliosis and there are two very recognisable causes. PS: apologies for the mirror image of this X-ray. Just note where the L for left is. Chiropractors tend to read X-rays with the L on the left, as in this X-ray, and radiologists with the L on the right. It can be confusing. Firstly a caution. 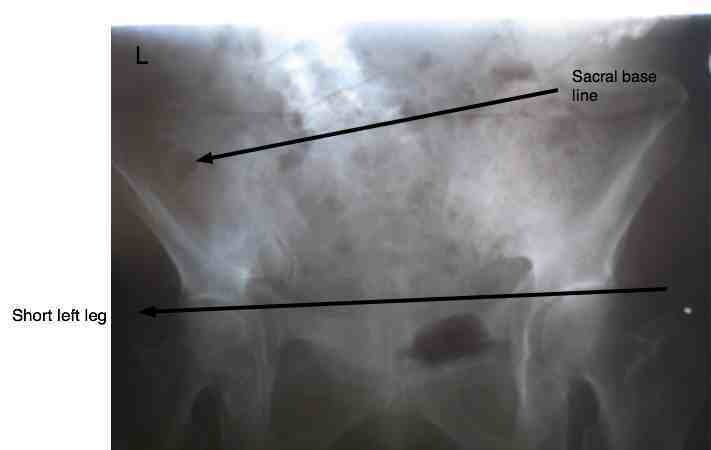 An X-rays should state ERECT / SUPINE. This one doesn't and it's an old X-ray. Making measurements of leg length on supine X-rays (lying down) can be very misleading. 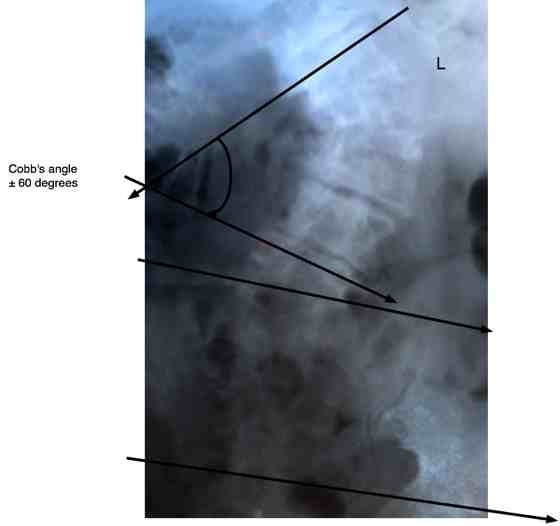 However, in this case, it is consistent with the erect lumbar X-ray, and the clinical examination. A leg length inequality. A short left leg. A low sacrum on the same side. On the left. 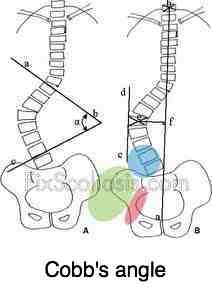 Normally the sacral base line is parallel to a line through the hips joints, and normally both are very nearly parallel to the ground. She remembers someone pulling a chair out from under her a child. If there has been an injury, such as a fall on the sacrum, causing it to shift, there is a 50/50 chance that it will compensate for the short leg. In Miss M's case it didn't. She has a double wammy of a short left leg, and a low left sacrum: SCOLIOSIS. Lower back and leg pain is legion in today's world where we sit too much; add to that a significant curvature, a short leg, a hemivertebra or a lumbarisation and you have all the makings of a very difficult back and lumbar spinal stenosis; any program of chiropractic treatment for scoliosis has to consider such problems. Sometimes it's simple and all that's needed is a lift in the shoe and an exercise program; that's should be the first consideration in any case in every chiropractic help schedule. Mild scolioses are common, perhaps almost the norm. So to be termed a scoliosis, a Cobbs angle of 10 degrees is the cut off. At 60 degrees Miss M has the worst scoliosis I have seen in thirty years. At a lecture to the Chiropractic Association of South Africa, the chairman of the Scoliosis Society gave a passionate lecture, inter alia stating that the treatment of scoliosis had no place in the clinic of the general practitioner or even the orthopaedic surgeon. In his opinion, it was a specialty so complex that it should remain in the domain of the specialist. He was generally complimentary of Chiropractic, and was wise enough to make no special mention of whether the chiropractor could be the primary care-giver to the adolescent scoliosis. Nevertheless, his point was taken: the care and management of scoliosis is a multi-disciplinary and very complex subject. The use of heel lift, a full shoe insert, a spinal brace, the correct exercise programme, what are the correct manipulations, these are all subjects that need to be very carefully considered and managed. It's not a condition for the average doctor, physiotherapist, orthopaedic surgeon, chiropractor who might see a scoliosis with a Cobb's angle of greater than 30 degrees on a regular basis. One exciting and innovative Chiropractic approach is being developed at the Clear Institute. They are treating adolescent scoliosis on a daily basis, informed about the new research, developing new techniques. If I was 20 years younger...! Scoliosis, like the treatment of the infant has become a specialty within Chiropractic. And that's where in my humble opinion it belongs. CLEAR INSTITUTE ... adolescent scoliosis treatment. The adult with scoliosis? Yes, of course, plenty. Miss M was sorely neglected on all counts as a child, not least of which was the placing of the heel lift in the wrong shoe. Lumbar spinal stenosis is the result of a neglected back; prevention wasn't considered when it was first realised that a person had significant lower back issues; this is quite apart from chiropractic treatment for scoliosis. A disciplined, daily exercises program each morning and evening, lasting no more than two or three minutes, is a vital part of saving yourself from lumbar spinal stenosis. Do think that five minutes a day too long to save yourself from this misery? 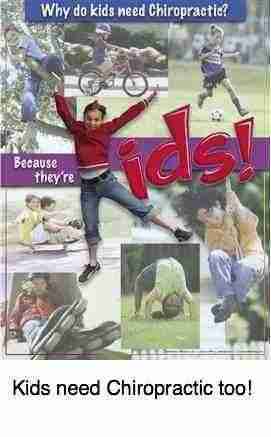 I do them myself, having had a serious lower back injury. Read about it at femoral nerve damage. It's been well researched now (I'll hunt for the reference) that Lumbar Spine Stenosis responds better than expected to Chiropractic. Happily Miss M responded immediately, and now after only 4-5 treatments can stand up straight again, has no pain in the leg, and declares that she has 85% less pain. There's no extension pain any longer, and the SLUMP TEST is now negative. We have started far earlier than expected into the rehab phase of care. Update: Miss M continues to do well. Not that it's perfect, of course not, but she can walk normally, has no leg pain, and only mild neck and back discomfort. She's now coming once in three weeks for treatment. Update: A very happy lady. There are many women in their eighties who would be glad to have as little pain as Miss M has. Extension and flexion are painfree, she can stand upright without pain. 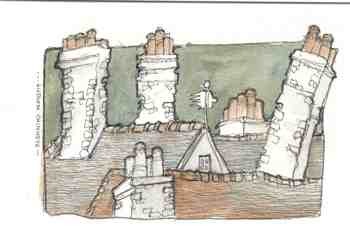 Of course, some niggling pain in the low back. No headaches either: we continue to adjust her neck very gently. Update: M still works full time! She finds that after about two weeks the lower back pain increases again, and she has some pain down the side of her leg once more. The SLUMP TEST FOR SCIATICA fortunately is negative. The first step, after proprioceptive testing, was to place a full insert, 3mm thick into her LEFT shoe. We may increase it later. Secondly, we used the Thompson drop (Terminal Point) protocol to balance her pelvis. Thirdly, some soft tissue work. Fourthly, lying on her right side a Chiropractic adjustment of L5 using the Gonstead technique. With an audible release. Fifthly, a supine adjustment, with drop, of the right ilium. Sixthly, Active Release Therapy of the hamstring and sciatic nerve. And of course, a set of exercises. Can a chiropractor fix an apparent short leg?